Located on the west of the Jiālíng River centre, Ciqikou ancient town is worth to visit if you curious about old Chongqing. 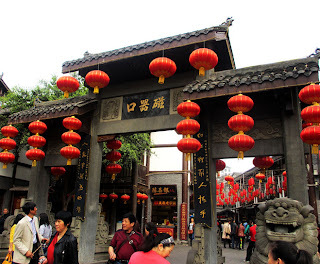 It is an old Chinese town with traditional style buildings and local flavor food. Most of the buildings can date back to Ming dynasty and were restored for tourists. 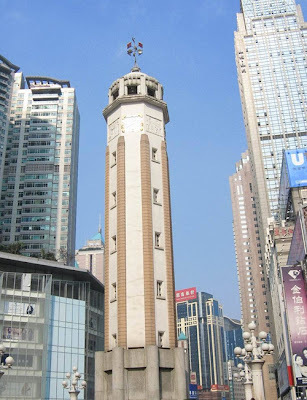 Its name derives from it is a town prospered from the porcelain trade. You can lose yourself in its peaceful and quiet lifestyle of Sichuan countryside. How to get there: take Bus No. 215 and get off at Tongjiaqiao Station, a taxi costs about Y30. Dazu Rock Carvings is China's famous ancient stone art dating back to 7th century AD.It contains all the cliffside carvings in Dazu County. Dazu County, located in the southeast of Sichuan province,is known as 'the county of rock carving'.The sculptures and carvings in Dazu County are mainly influenced by Buddhist, Confucian and Taoist beliefs. 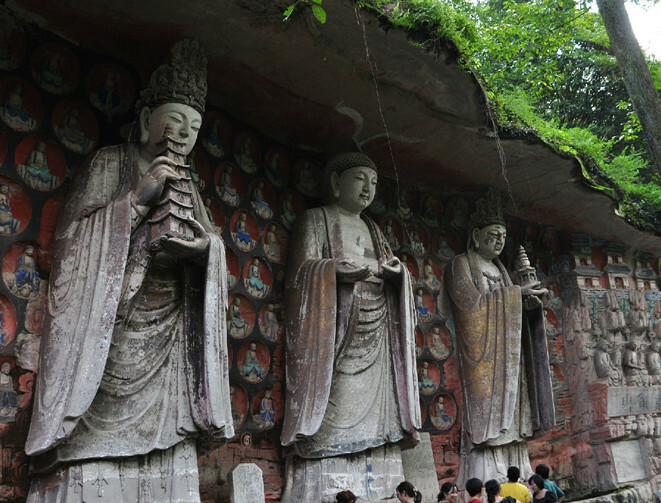 As one of the World Heritage Site, Dazu Rock Carvings are made up of 75 protected sites containing some 50,000 statues, with over 100,000 Chinese characters forming inscriptions and epigraphs. Located at the intersection of Minzu Road, Minquan Road and Zhourong Road, the People's Liberation Monument is considered as the Chongqing’s landmark.It was first built to inspire Chinese people in the past,but now it is the commercial center of the Yuzhong District in Chongqing.It’s a gathering place for shopping Malls, fancy restaurants and hotels,and other entertainments. Located in the west part of the People’s Square of Chongqing, Three Gorges Museum is not only specified museum of Three Gorges but also a museum of chongqing’s history and art.The first floor is mainly about the Three Gorges including a model of the dam.On the upstairs,It shows the culture of southwest China's minority with a collection of over 170,000 pieces of cultural relics.. 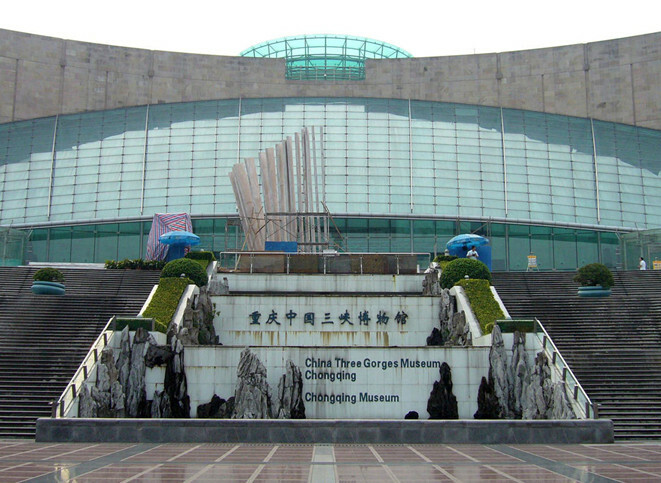 Located at the foot of Jinyun Mountain on the north side of the Jialing River, Southern Hot Spring Park is the foremost garden park of Chongqing. 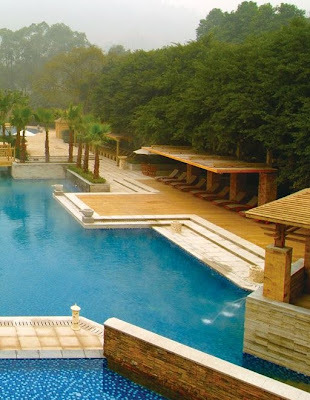 With hot springs, harming natural scenic spots and cultural relics,the park attract numerous tourists every year.The park has 110 bathrooms and 3 swimming pools.Here is an ideal place for relaxation.Besides hot springs, you can enjoy a great view with temples, hills, water, woods, springs, gorges, caves and much else besides.